The last weekend in April is generally regarded as a dumping ground for movies that studios are unsure about with regards to box office success. Not surprisingly, there are four openers this weekend, and at this point it looks like all four are going to miss their expected box office number. The Five-Year Engagement looks to be the most disastrous of the four, projecting out to $10m-$11m at this point (most columns had it raking in $15m-$20m this weekend). 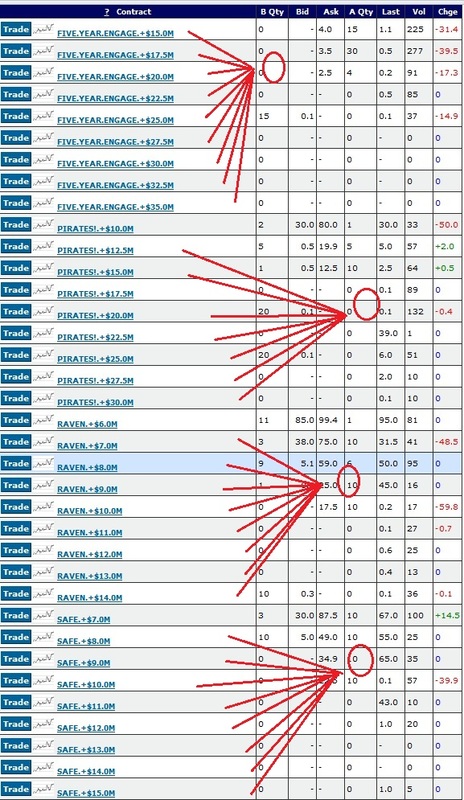 Overall this point, it looks like 30 of the 33 Intrade movie strikes will expire at 0. I was slammed at work this week and thus only managed a medium-sized short on Raven at $11m, $12m, $13m, and $14m. Still an easy $100. Missed last weekend, hit this weekend. I’ve been busier than normal at work this week and thus “zoned out” of the movie markets Tuesday, Wednesday and Thursday. 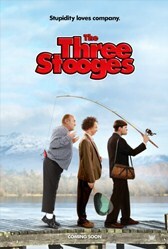 There are three new openers this week…”The Cabin in the Woods,” “Lockout” and “The Three Stooges.” I think that Lockout and Stooges have the potential to be absolute bombs. The PG-rating and short run time on Stooges might help inch the movie over the $12m mark, but I see little breakout potential for the film. 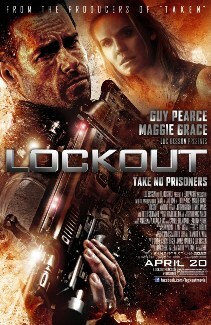 I honestly have ZERO clue what Lockout is about, even after seeing three or four TV ads for the film. 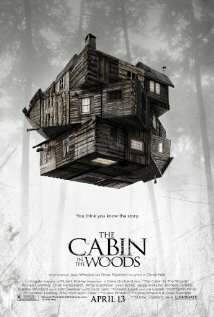 All I know is the Guy Pearce seems to have added a few inches to his biceps. As for my positions, I shorted some Cabin early in the week at high prices that I don’t expect to hit but hey, I’ll take 5:1 odds. I also shorted some Stooges. Will post a full p/l recap on Monday. 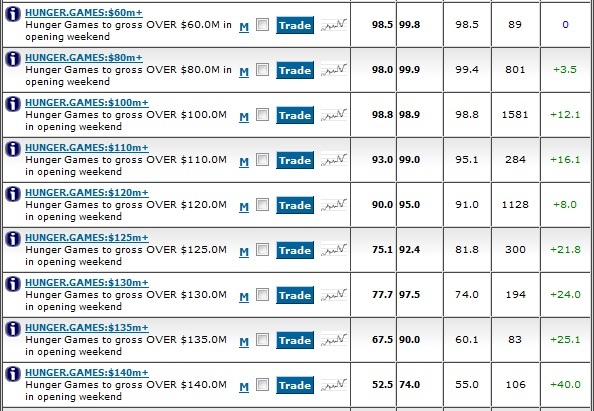 At the risk of jinxing myself going forward, I’ve been on a bit of a tear recently in the Intrade movie markets. This weekend’s score was mostly due to my analysis and subsequent prediction that “American Reunion” would be massively front-loaded (front-loaded is when a movie makes a disproportionate portion of its weekend gross on Friday as compared to Saturday and Sunday). Conventional wisdom held that the film would have an internal multiplier (total weekend gross/Friday gross) of around 2.6, but my research of past R-rated movies to come out on Easter weekend showed that an internal multiplier of between 2.35 and 2.45 was more appropriate for projections. The Friday number for American Pie came in at $9.25m, and thus most sites thus projected out a weekend total of $24m ($9.25m x 2.6). However, using my alternate internal multiplier, I projected a low number of $21.7m and a high number of $22.7m for the film. These projections thus made the $22.5m and $25.0m contracts ideal shorts at prices between 75 and 87.5, and 20 and 30, respectively. 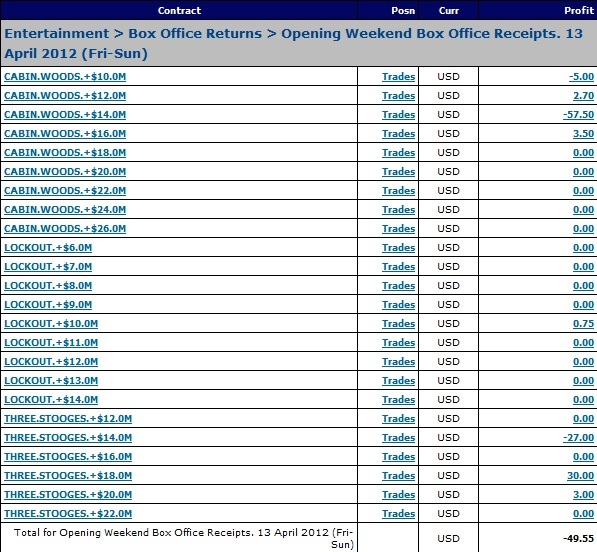 So when the film’s actual weekend total of $21.5m came in, the result was a nice 4-dime payday. For the record, in the end “American Reunion’s” internal multiplier was 2.32. I wanted to share my strategy in a Saturday post, but unfortunately there was too much free money sitting out there! Well the whole country has gone mad with Mega Millions fever, which at last count was up to a staggering $640 million jackpot, but let’s not forget there are two new wide-releases in theaters this weekend. 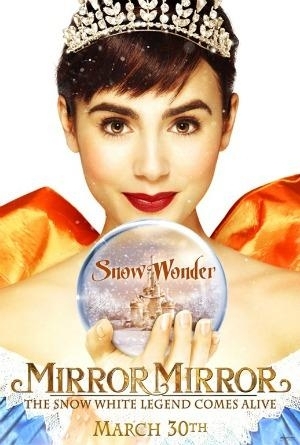 “Mirror Mirror” hits 3,603 locations and stars Julia Roberts in an adaptation of the classic “Snow White.” It’s hovering right above 50% on Rotten Tomatoes and hasn’t had much buzz to speak of. I’ve only seen a few television ads for the film, but as a late-20’s guy, my TV channels are probably not on the film’s targeted list. 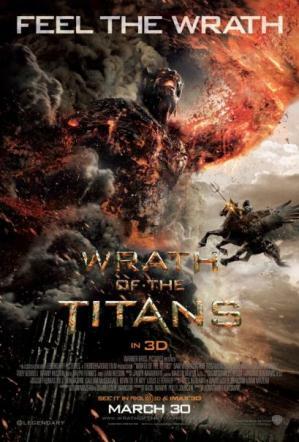 “Wrath of the Titans” invades 3,545 locations and features of a variety of Hollywood stars. The film is a follow-up to the 2010 movie “Clash of the Titans,” which actually fared quite well at the box office, netting $61 million in its opening weekend. “Wrath” is not expected to do anywhere near that number, but still could bring in $35m+ this weekend. Here are what the major prognosticators are projecting for the two films. $76 trading profit so far on positions I initiated then sold out of. “The Hunger Games” is set to invade the box office this weekend at 4,137 theaters (including 268 IMAX locations). 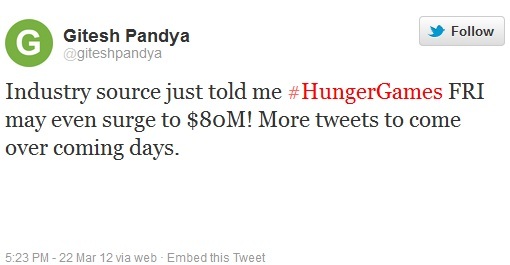 Early tracking numbers three weeks ago projected Hunger Games as a $75m+ opener, quite an accomplishment for a non-sequel March opener. Since then the buzz surrounding the film’s opener has exploded and now industry insiders speculate that the movie may smash both the March and non-sequel opening weekend record (both held by “Alice in Wonderland” – $116.1m) and gross as much as $140m this weekend. I plan to see what the midnight numbers are for the film tonight before posting a final projection. I’m currently trying to short the $130m, $135m, and $140m contracts on Intrade.